"Macoris" and "Macorís" redirect here. For the city in northern Dominican Republic, see San Francisco de Macorís. For the Neo-Taino people, see Macorix people. San Pedro de Macorís is a municipality (municipio) in the Dominican Republic and the capital of the San Pedro de Macorís province in the south-eastern region of the country; it is among the 10 largest cities of the Dominican Republic. The city has approximately 195,000 inhabitants, when including the metro area. As a provincial capital, it houses the Universidad Central del Este university. The name San Pedro came before that of Macorís. There are three versions regarding the origin of the name: the first attributes it to the fact that there is a San Pedro Beach in the city port; the second sees it as a tribute to General Pedro Santana, who was President at the time; and the third simply said it was in order to distinguish it from San Francisco de Macorís, a city in the north. San Pedro de Macorís has been poetically referred to as "Macorís of the Sea", "The Sultan of the East" and many call it the "Capital of the East". The city was established in 1822 on the western margin of the Higuamo River as a result of the immigration of settlers from the eastern part of Santo Domingo. In the year 1846, at the request of the inhabitants of the place called Macorix, the Conservative Council decided to declare the place as a military post. At that time, Macoris belonged to the province of Seybo, being made up of three communes: Seybo as the head municipality, Higüey and Samaná. Calle Sanchez in the historic center of San Pedro de Macoris. After 1840, the inhabitants moved from the western margin of the Higuamo to the eastern margin, where the city of San Pedro de Macorís was born, becoming one of the most productive cities of the Dominican Republic. The population was gradually increasing, dedicating itself to the production of provisions, and the quantities that reached the port of the capital in the boats of Macoris in the years 1868 to 1875, which were baptized there to the old fishermen's abode, were so great. the name of Macoris de los Plátanos. Historic center of San Pedro de Macoris. San Pedro de Macoris experienced a significant wave of migration in the late 19th century from Cubans who were fleeing their country's War of Independence. They brought their extensive sugar cane farming knowledge and contributed to making the sugar industry the most important economic activity in the area. San Pedro de Macorís reached its peak during the first quarter of the 20th century, when its sugar production enjoyed high prices on the international market as a result of the First World War. Many Europeans also settled in the city, making it a very cosmopolitan urban center. Pan American flew its seaplanes in regularly (Eastern Macorís has the privilege of being the first Dominican city to receive seaplanes, in its Higuamo River), at a time when this port enjoyed more commercial activity than the capital city of Santo Domingo. The next economic boom resulted in the recruitment of a large number of Afro-Caribbean workers from the Lesser Antilles. These workers and their descendants would soon comprise the majority of the population in the city and are known as the "Cocolos of San Pedro de Macoris." San Pedro de Macorís pioneered many areas such as the first firefighting corps, the first national baseball championship, the first town to have telephone and telegraph centers, the first racetrack and the first boxing coliseum, among others. The first sugar factory was founded by Juan Amechazurra, milling for the first time on January 9, 1879. By 1894 there were many factories in the province that reached a high level of progress. The rapid industrial development placed the young city among the main ones of the Republic. The intellectual culture surged at the same pace with schools and the press; among the first newspapers were "Las Novedades", "Boletín", "La Locomotora" and "El Cable." Some of the distinguished poets from San Pedro de Macorís include René del Risco, Pedro Mir, who held the title of National Poet; Esterbina Matos, Ludín Lugo, Juan Brayan and Mateo Robinson, among others. In regards to drinks, Macorís produces the "Guavaberry", a drink based on the araijan fruit, which is consumed during Christmas and has a sweet taste, not unlike a wine. It is frequently consumed in rum as an infusion. Although the species grew in Hispaniola already its use was introduced and spread by immigrants from the Eastern Caribbean where colonists had discovered it as a substitute for myrtleberry-infused schnapps. The people of San Pedro de Macorís also enjoy gathering in the Malecon, an avenue for drinking and enjoying music. After dark, the Malecon becomes a drinking hub to enjoy dancing and an ice cold beer. The city is home to the Estrellas Orientales in the Dominican Winter Baseball League, who play at the Estadio Tetelo Vargas. San Pedro de Macoris is well known as the birthplace of a disproportionate number of professional baseball players. According to Baseball-Reference, 76 players in Major League Baseball history were born in San Pedro de Macoris. The city is often referred to as "The Cradle of Shortstops." ^ De la Fuente, Santiago (1976). Geografía Dominicana (in Spanish). Santo Domingo, Dominican Republic: Editora Colegial Quisqueyana. ^ gour.net (2006-01-12). "San Pedro de Macoris". Archived from the original on 2008-05-17. Retrieved 2007-10-13. ^ "S.P Macoris Climate Normals 1961-1990". National Oceanic and Atmospheric Administration. Retrieved September 19, 2016. ^ Marta Lugo (2005). "San Pedro de Macoris, Dominican Republic". Retrieved 2007-10-13. 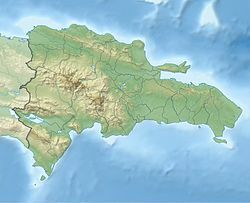 ^ The Dominican capital of Santo Domingo currently has 106 MLB players compared to San Pedro's 76, but Santo Domingo's population is more than ten times that of San Pedro. This page was last edited on 6 March 2019, at 04:12 (UTC).